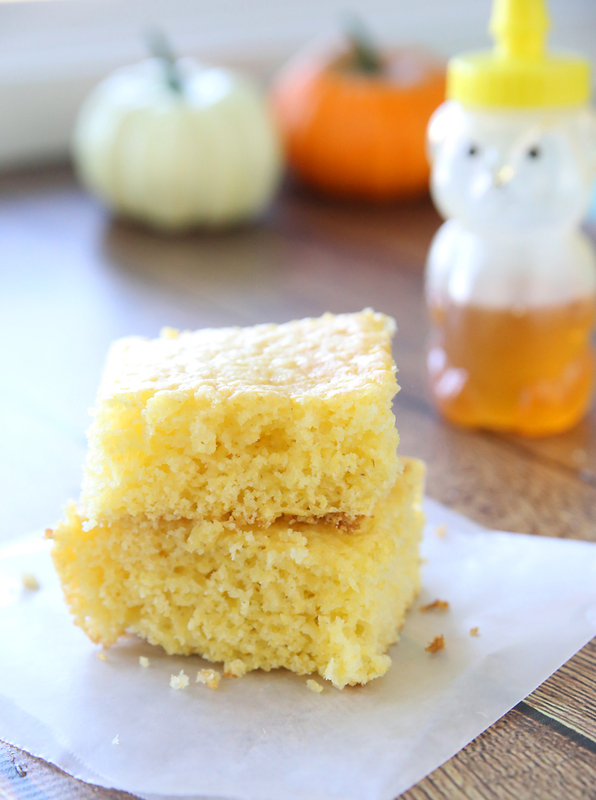 Quick + easy sweet Jiffy cornbread recipe everyone will love! 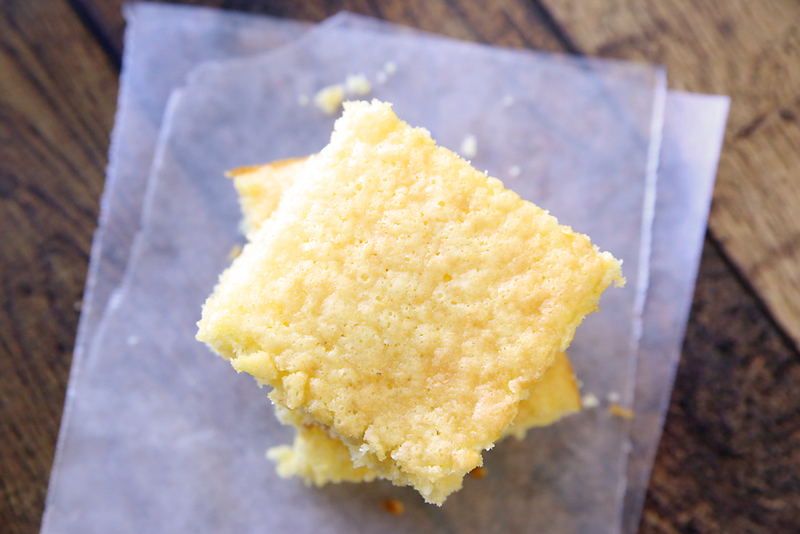 Make soft, sweet Jiffy cornbread in minutes with this classic Jiffy cornbread recipe! It combines a cornbread mix and a yellow cake mix for the perfect moist bread. So there are some words that just don’t mean the same thing in different parts of the country. “Cornbread” is one of them. In the west, where I grew up, cornbread is soft and sweet and maybe more like a dessert than a bread, but hey, it’s still called cornbread so we eat it with meals instead of for dessert. 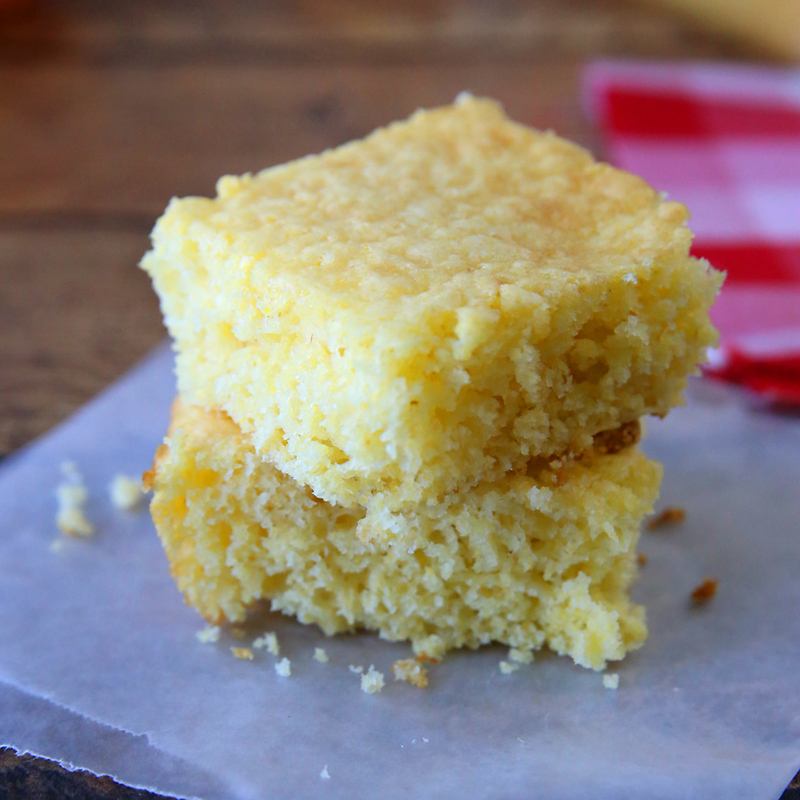 But in the south, cornbread is rougher in texture, not nearly so sweet, and often full of actual corn kernels. I can’t tell you how disappointed I was the first time I ordered cornbread in Memphis and got, you know, actual cornbread instead of the cakey stuff I was expecting! 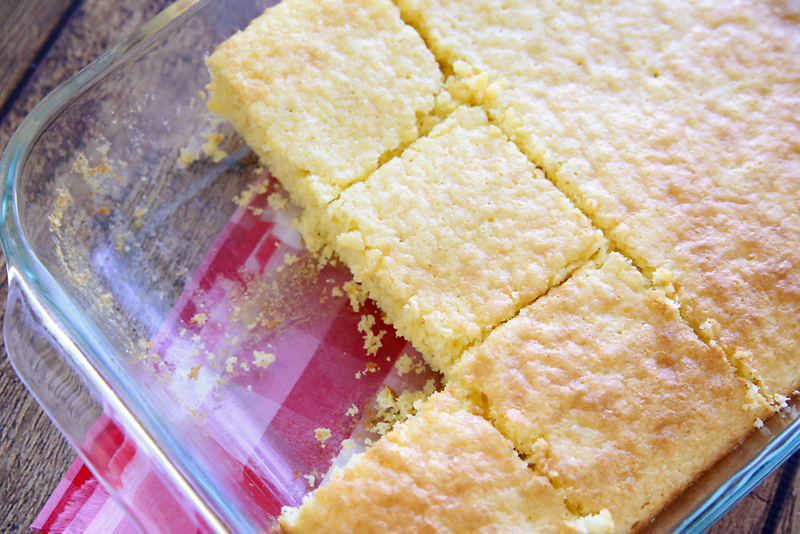 If you’re a fan of Southern cornbread, you can pass this post on by. But if you have a hankering for a moist, sweet cornbread that you can smother in butter and honey and serve up with a big bowl of chili, this recipe is for you! I’ve made cornbread from scratch before, and it was pretty darn tasty. But this “Jiffy” version is so fast to put together that I find myself making it every time we have chili, which is good, because chili makes half of my children cry. Sigh…but luckily they love this cornbread so much they can usually be persuaded to eat a small bowl anyway. 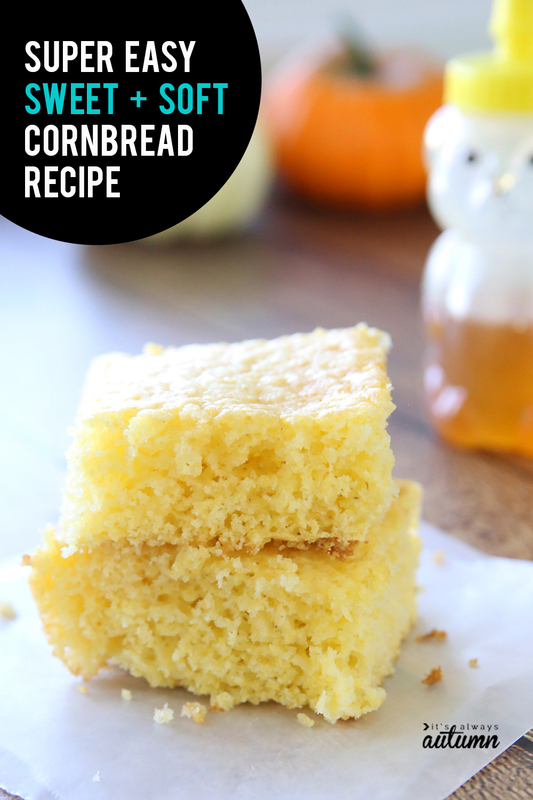 It always turns out moist, soft and sweet, not dry and crumbly like other cornbread I’ve tried. This “recipe” couldn’t be simpler. 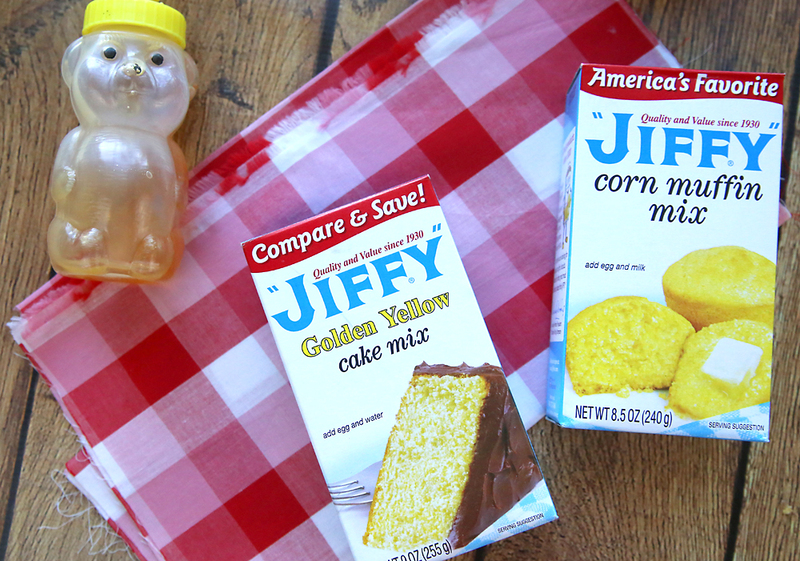 It’s a mashup of the Jiffy brand corn muffin mix and the Jiffy brand Golden Yellow cake mix. You know, the ones in the little boxes that look like they’re from the 1950’s? Dump the mixes, eggs, milk and water in a bowl, whisk to combine, pour in a 9×13 pan and 20 minutes later you have warm, sweet cornbread. 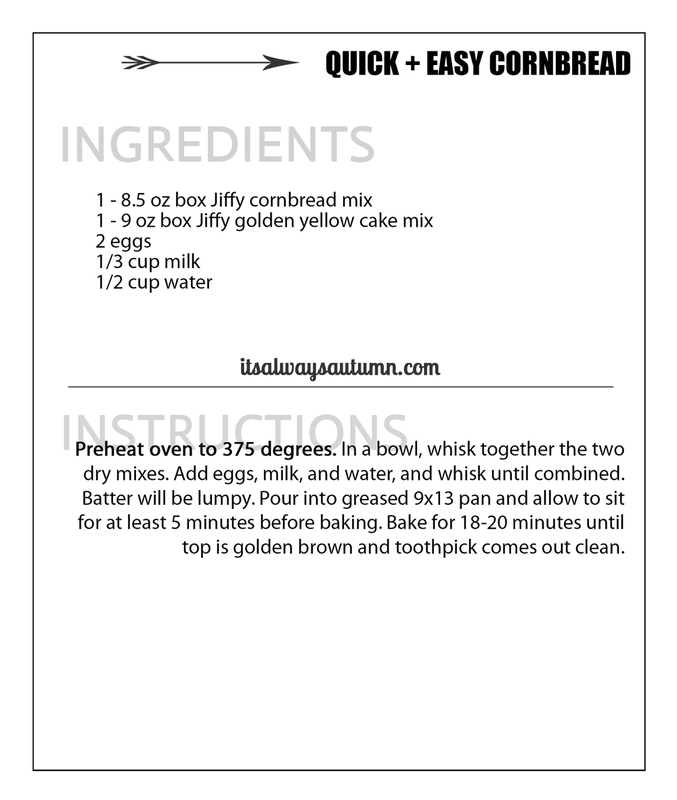 Hope you enjoy this easy favorite family recipe for sweet Jiffy cornbread! If you need a great chili to make with this, give my sweet bacon chili recipe a try! It would also be amazing with this creamy chicken and wild rice soup. You can order Jiffy Yellow Cake Mix from Amazon. 6 boxes for $14. I can never find the Jiffy yellow cake mix. Where did you get yours? Walmart carries them! By the other cake mixes. BTW, your kids are all SO CUTE! I can’t find the jiffy cake mix and don’t have time to order. Can I use another basic brand of cake mix?